The Isle of Wight sits in the Solent, about 5 miles off the Hampshire coastline and was once a favourite holiday destination for Queen Victoria. The Island has given itself the title of the ‘most haunted Island in the world’, a reputation which is richly deserved according to the books available about the Islands ghosts and many places on the Island can claim at least one ghostly inhabitant. One location that can beat all of the other’s hands down for its paranormal infamy is Knighton Gorges. Situated in the parish of Newchurch, Knighton Gorges was once the grandest mansion on the Island and stood for over seven hundred years but sadly, all that remains today are two decaying stone gateposts and an overgrown driveway. Built in the 12th Century, it’s past residents include many noble families such as the de Morvilles, notably Sir Hugh de Morville, who was rumoured to have had a hand in the death of Thomas á Becket in Canterbury Cathedral in 1170 and was never brought to Justice. Its history includes tales of murder, passion, scandal, madness, suicide and revenge; all of which are good ingredients when brewing up a spectre or two. Gay Baldwin, the book’s author has lived on the Island since the age of four, so has a vast amount of local knowledge. She has written eight books, as well as produced several audio books and a DVD on the ghosts of the Isle of Wight. As soon as you read the introduction to this book, you feel you are in safe hands with Gay. Although she describes herself as being ‘not a historian, just a journalist with considerable experience writing about the paranormal’, the history given in the book is comprehensive and absorbing. The history section whisks you through to chapter five with little effort on your part, where the stories on the ghosts, ghost sightings and witness testimonies begins. The land on which the house used to sit is private property but still appears to be a Mecca for ghost hunters, particularly on New Year’s Eve. For those who don’t know of the ghost stories connected with Knighton Gorges, the most famous appears to be of a traveller, who on New Year’s Eve one year came upon the house when he was almost ran down in the road by a coach and horses. Angry at his near fate, he approached the house intent on complaining of the recklessness of the coach driver. He knocked loudly on the door, but no one answered him. A New Year’s party was in full swing, with the sound of music and laughter emanating from the house and assuming that the inhabitants couldn’t hear him over the sound of their merriment, he peeped through the window to gain someone’s attention. He saw people in Georgian costume; fancy dress, he assumed. Yet again, he knocked and received no response. Incensed, he eventually gave up and continued on to Newchurch, where he found lodgings for the night. During his meal, he told his hosts of his experience and on production of a map to show them the location of the house, he pointed out the area where Knighton Gorges once stood, although it had long since been demolished. Many people have claimed to have seen the house since, either fully or partially, or heard music, singing and laughter on New Year’s Eve and many of the witness testimonies are listed in chapter five. There are several other reports of ghostly phenomena from the site of Knighton Gorges, past and present and until I read this book, I had no idea quite how many there were! There are tails of ghostly horses, phantom figures, light anomalies and time slips. Vehicles inexplicably break down and suffer electrical malfunctions just outside the gates - which is something that has also happened to the author, camera and mobile phone batteries drain and bizarrely, there are occasionally stone animals spotted on top of the old gateposts, although the statues, if they were ever there, disappeared years ago. 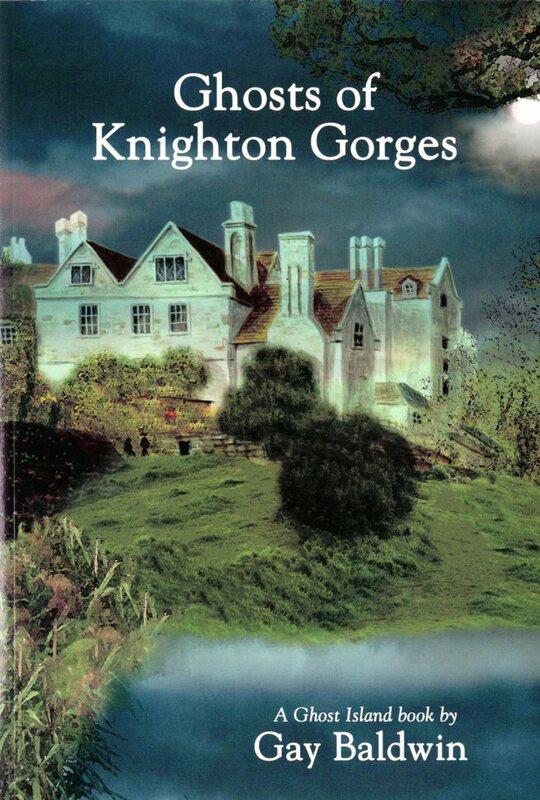 The author also explores the ghost stories of the surrounding locality, some of which may well be connected with Knighton Gorges. Some of the houses, barns and outbuildings were made from reclaimed materials from the mansion. There is also a section on the findings of psychics and mediums who have visited the site with the author, which makes for interesting reading. The book is split into twelve fact-packed chapters and there are a good selection of photographs, maps and plans. Sadly no photographs of Knighton Gorges exist as the camera hadn’t been invented at the time the building was demolished (in 1819 or thereabouts). However, the author makes good use of artist impressions and engravings, so you can get a good sense of what the mansion looked like. Personally, I feel that after reading Ghosts of Knighton Gorges, I have an increased sense of enthusiasm that I haven’t felt after reading a book on the paranormal for a long while (and I read a lot)! I thoroughly recommend this book to anyone either interested in ghosts, or the history of the Isle of Wight and will definitely be seeking out the crumbling gateposts of Knighton Gorges for myself next time I visit the Island.